daff circle, originally uploaded by jahansell. Daffodils are in full bloom - in the last few days I've seen azaleas, tulips, fattening buds on lilac trees - after that endless dormant period where nothing changes for days, weeks, months, it's all moving at freight-train speed now! After a week and a half of blazing sun, it's finally raining a bit now with more forecast over the next few days. Just in time for emerging gardens. I will continue the blog, posting as I can. I hope never to let a week go by without a couple of photos, but I don't want to post a boring or repetitive photo just for the sake of posting, either. I've been invited to photograph at some interesting homes and gardens, so that will provide fresh opportunity, and there's always something new to do and see and shoot - I will continue to do that, and to bring photos of Sharon to all who have come to rely on this blog for a taste of life in our beautiful corner of the world. I appreciate all your thoughtful comments, and so often when I've thought of quitting, it's you, the readers and visitors, who have kept me going. Sometime soon I will post a new header reflecting its "non-daily" status. I'll keep the URL as so many have it bookmarked. I'm glad you'll still be posting occasionally. Thanks for all the pleasure your photos have given us over the past two years. so many blogs still labeled "Daily Photo" post so infrequently that they should change their title. No need to change their URL. 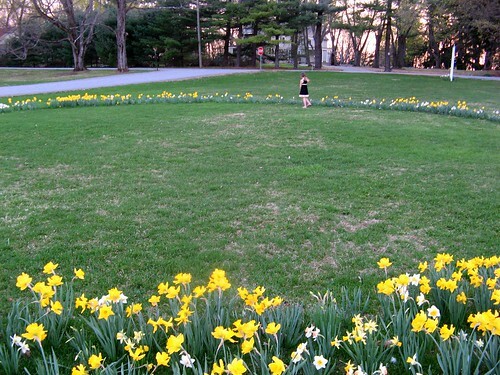 I love the circle of daffodils. We'll look forward to your postings even if they're not daily. We really enjoy your photography and seeing Sharon in pictures.